In India, summer is almost over, even though in my state, is never over, but we are blessed with heavy downpour almost everyday nowadays. What a bliss, aha!! I'm just loving the rain after 2-3 months of over 40 degree C temperature. And in India, summer is synonymous to mango. This summer, I've experimented some unusual recipes with mango along with the regular ones, like Mango lassi, mango smoothie or mango slush etc. I'll share today one of my experiments with you. 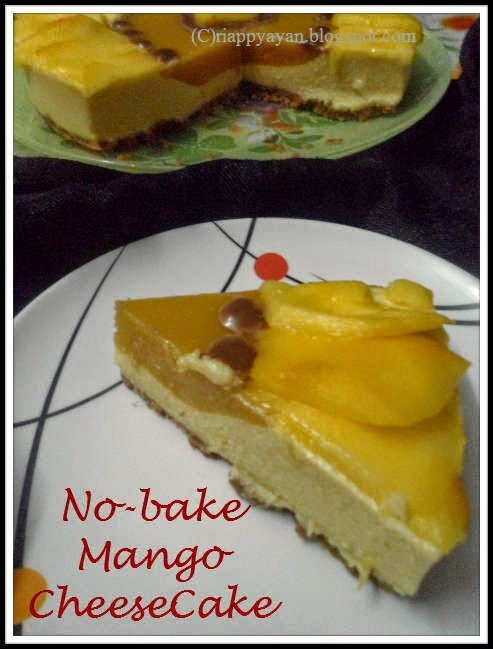 I made a no-bake Mango cheese cake with very easily available ingredients. The main ingredient of Cheesecake is cream cheese, which is not easily available throughout India and even we get it, the price is quite high. After searching for some recipe to substitute the cream cheese, I found a recipe in my fellow blogger's page, Yummy Tummy, which is made with Indian Cottage cheese(paneer), condensed milk and gelatin. 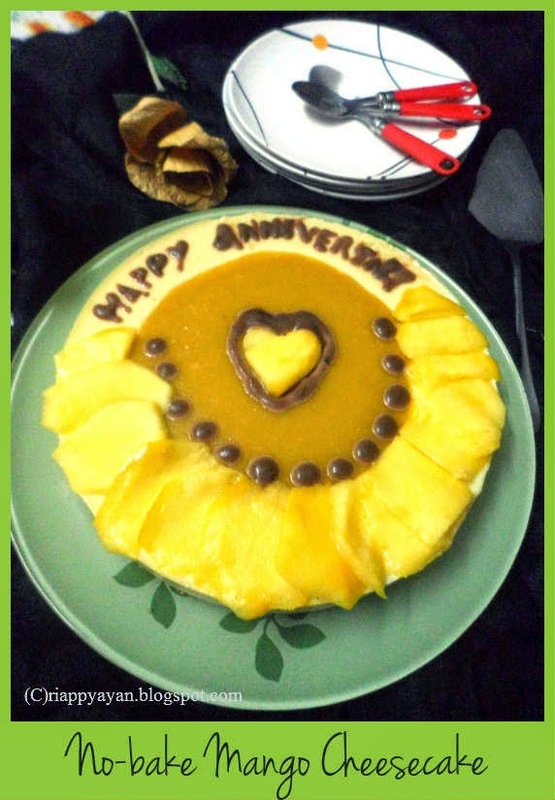 I immediately collected all the ingredients and made this no-bake Mango cheesecake for my marriage anniversary. My whole family and relatives loved the cake. The assembling of this cake is quite easy. Do not discourage yourself seeing the long list of ingredients. 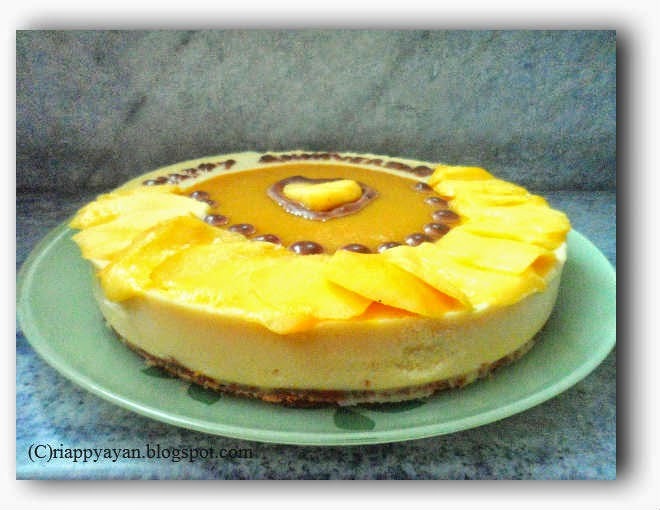 This no-bake mango cheesecake has three layers, bottom layer is made with biscuits like arrowroot biscuits, whole-wheat Marie or crackers etc. I made mine with whole-grain digestive biscuits. Second layer is mango flavoured cream cheese layer and top layer is mango jelly. 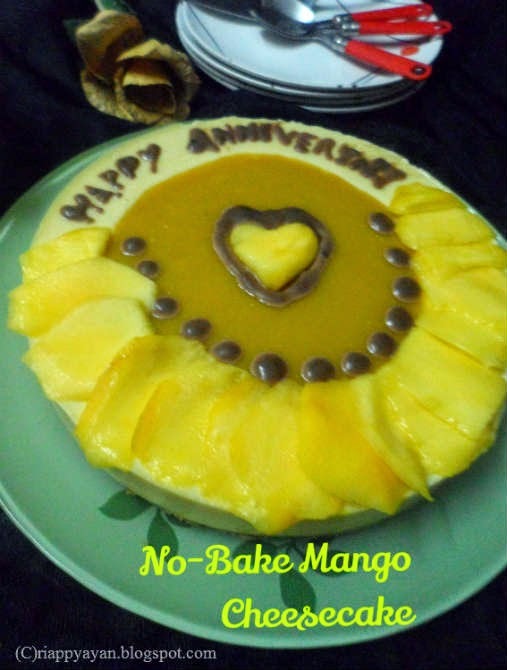 You can avoid the top layer and just decorate the top with fresh mangoes or any other way. Follow the steps properly and you can have a delightful dessert in your hand to be proud of. baking pan(like the pic. In this pan, it is easy to de-mould the cake. Or you can also assemble in tall glasses or bowls, which also looks very pretty. I used a 7" springform pan. Mango puree - 200 ml. Preperation : Start making this cake, by soaking total of 5 tblsp. gelatin(for the cream cheese layer and for the mango jelly layer together) in cold water for around 15 minutes till it plumps up. Puree 4 large size mangoes in a blender until smooth. Divide into two bowls and keep aside. Prepare the base and side of the springform pan with little butter. For the biscuit layer : Take biscuits in a blender and make a fine powder. Now melt butter in a pan. switch off the flame when butter melts down. Now add the biscuit powder into the butter. mix well. When mixed well, all the biscuits will come together. Spread the biscuits mixture on the base of the pan evenly with the help of spatula, press with hand a bit to set and put the pan in the refrigerator for 15 minutes. For the mango cream cheese layer : Take paneer, condensed milk, vanilla and sugar in ablender and blend until it forms a smooth puree. Add half of the mango puree in there and mix again till smooth. Pour this in a bowl. Now take enough water in a pan to dissolve the soaked gelatin and continue stirring with a spoon until totally dissolved. Now immediately pour half of the gelatin mixture in the above mango-paneer mixture and mix well. Pour this mixture over the biscuit layer and refrigerate this for 30 minutes to set before you add the third layer. For the top/mango jelly layer : Add other half of gelatin mixture in rest of the mango puree. Mix well immediately.Then pour this over the cheese layer and refrigerate for at least 4-6 hours. I have not covered the whole cake with mango jelly, I used only in the center and decorated with fresh mango slices and melted chocolate.